my past two weeks perfectly ;). Last week was a crunch time at work, and a need to take care of something really important took me away from a timely update, so this is sort of a two in one post. First, I've been looking at a variety of resources available online to learn about and practice using PHP. PHP can do a lot of interesting things and display output, pull in a variety of information sources, and simplify some tasks, but to do that, there needs to be a fair amount of tinkering involved. Second, just like HTML all by itself will not give a web site a nice look and feel, PHP will not be the be all and end all of interactivity, either. Setting a site up from scratch means that there is a fair amount of interplay to work out, configuration details to tweak, and a lot of refreshing to see changes. Also, without a back end database, much of what is being done in the pages is superficial and not very interesting, though it does help to hammer out syntax. 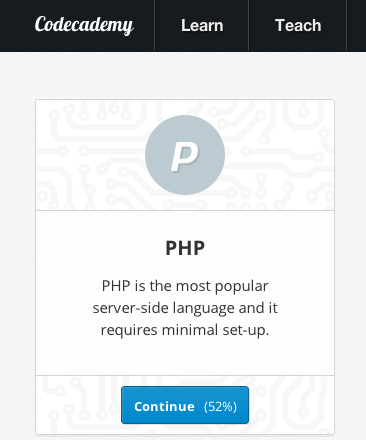 I've finished the Codecademy modules that cover PHP (YAY ME!!!) . There's some oddity with their interface when it comes to competing certain assignments and exercises. I have found myself not able to complete a module that I have been actively working on, even though the "code" is correct for the context. I have also closed down my browser, reopened it, gone back to the section I was just working on click save again, and gotten a "Success". Why do I mention this? Because I'm willing to bet others might be struggling with some examples and scratching their heads wondering why Codecademy isn't accepting their results. Often there are typos, and those are easy to fix, but if you find yourself in a spot where you cannot get it to work, no matter what you do, try closing your browser and coming back to the module and saving again. Noah stated in the initial comment that we should be prepared to spend a few weeks on this initial project, and to be open to the fact that we will be doing a lot of mucking around to get it to work. Just being able to manipulate pictures would be considered a positive milestone. I thought this would be relatively quick; I mean, how hard could it be to just put up a simple site with PHP? The point is not to just put up a site with PHP; there's lots of ways to superficially do that. The image manipulation challenge is what sets it apart. Noah gives us an authentic problem, and asks up to solve it, without guidance as to how or what to use to do it. This process led me down several paths and experiments. I set up a local stack on my personal machine. I set up a LAMP server in a virtual space. I set up a site already on the open web to use PHP and experimented with commands and syntax. I rolled several pages of my own to see how it all fits together. I downloaded a ready packaged "template" to get some ideas and save me some keystrokes. I swapped ideas between the home grown pages and the template pages. In short, I tried things, I tweaked them, I went down several dead ends, and I predict I'm going to go down several more. One thing I learned from my time when I was releasing a podcast every week was that I had to learn just how long it would take to do something. At first, I was wildly over optimistic. I figured my skills with writing music and doing audio editing would make doing something as simple as editing a podcast a breeze. A clip here, a snip there and all would come together. If I wanted to have a slap-dash product, with little regard to the end experience of the listener, that was true. It took little time at all to edit a program that sounded hacked and choppy, but hey, it got the main points across. To make it sound good, to make the audio flow naturally, to remove pause words (the ums, ahs, likes and you knows) and to make the transition sound smooth and clean, to preserve the natural narrative so that the interviews and programs were comfortable to listen to, took a considerable amount of time to do. I realized I couldn't put in a four hour editing session and have a product that sounded good, but I could put in four one hour editing sessions spread over several days and make a podcast that sounded great. The difference? Spreading out the effort is vital, because discernment and clarity come with repeated practice, and some down time to let the brain reflect offline. We don't get that same level of clarity when we try to push everything into one night to put it all together. My mistake has been more of the latter and less of the former. When we do that, we seek short cuts. We look for quick hacks that "work", for some definition of "work". Our standards for what is "acceptable" go way down, and we repeatedly say "oh heck with it, I have it working, it's good enough". Doing it a little bit at a time, and coming back to reflect on what we are doing, lets us see things that could be done better, and that we realize we really can do better, and without a lot of extra pain and effort. Last week, I tried to put it all together at one time, and was frustrated. This week, I managed a little more spacing, and got closer to a level of skill that I could feel like I'm doing something useful, but I know there's lots more I need to do to even have something basic in place. So yeah, the past two weeks have been hectic, scattered, and less focused and more "bunched up" in my efforts than I want them to be. It feels like how I see many programmers having to work because of issues and changing priorities, and I have a greater empathy for them and what they go through, even to meet my own arbitrary "deadlines". If that is part of the "lessons learned" that Noah wants to encourage, I think it's working very well. CAST 2014 will be held in New York City August 11-13, 2014. I will be giving a talk along with Harrison Lovell. Details on this will follow, but not until it gets officially posted. I want to see as many of you as possible come attend CAST 2014, because I feel it is one of the best, if not THE best, software testing conferences a software testing practitioner can attend and come away with real value for their time and investment. As I said previously, you will see me doing a lot more commentary and promotion for CAST going forward. Having said all that, I want to talk about something that is a preamble to CAST, and looks to be turning into an annual event that I support and want to see thrive. That event is called "Test Retreat". Test Retreat is rapidly becoming one of my favorite events to attend each year. This year it will be held Saturday, August 9, 2014 from 8:30 AM to 4:30 PM (EDT). I attended the inaugural event in 2012, when it was introduced at CAST 2012 in San Jose, CA and then in Madison, WI during CAST 2013. What makes Test Retreat worthwhile? 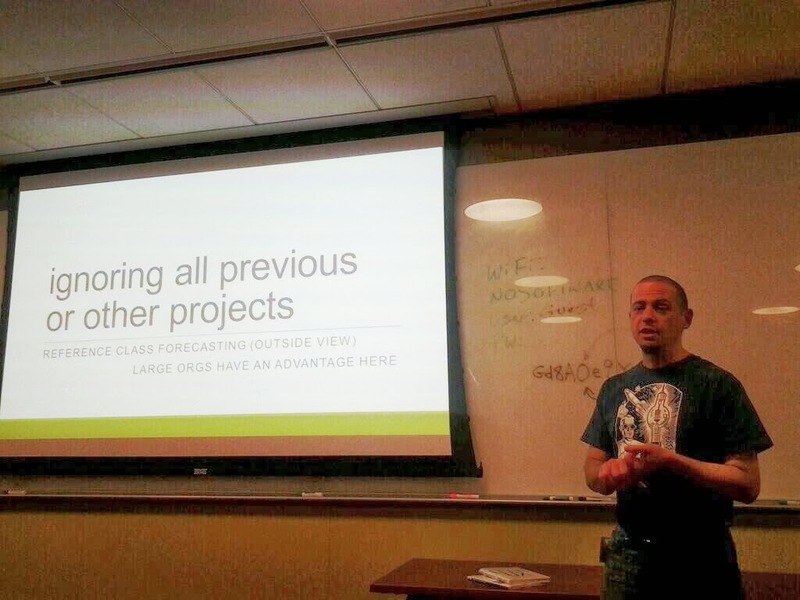 Many other events allow a select few to present on ideas that have to be highly structured. The Open Conference option that Test Retreat offers allows me, and others, to present ideas that might be very preliminary and embryonic. Through the event, these preliminary ideas often develop into calls for action, with input from many other participants, that are significantly better than anything I would have proposed on my own. It's this rich level of interaction, conferring with peers, and all willing to work together to develop "better ideas" that make this format a success. 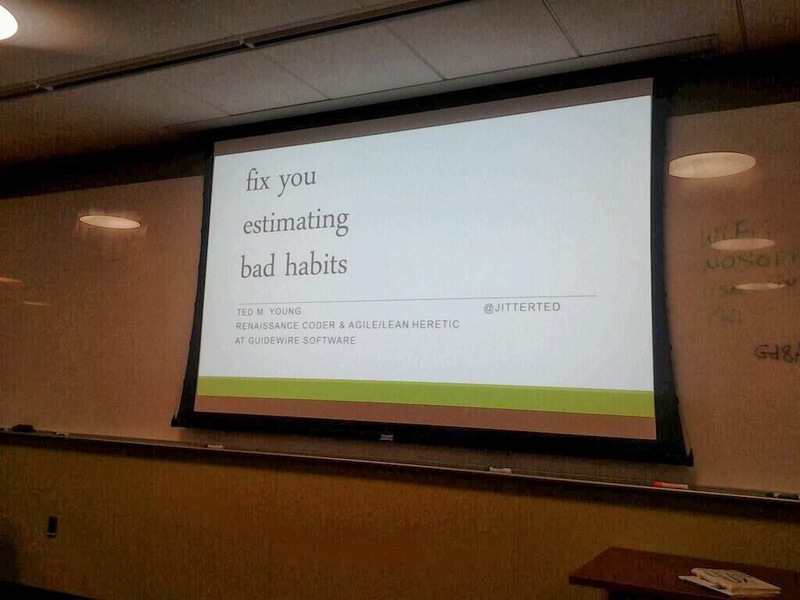 Several of my better talks (Let's Stop Faking It, Balancing ATDD, GUI Automation and Exploratory Testing, and others) that I have given at Meet-Ups, conferences and have written up as published articles and papers have had their genesis in Test Retreat. For those wondering if it makes sense, or if it's worth it to attend a Saturday event (yes, I know Saturdays are precious), I say "yes"! So far, it has proven to be every bit worth it these past two years. I've already signed up for year three. Will I see you there? Will we, perhaps, come up with better ideas together than we would separately? I hope you will come attend and find out! This past weekend, I had the honor and pleasure to celebrate three new Eagle Scouts in my Troop at a Court of Honor that we held for them this past Saturday. Since the boys in question were all associated with Order of the Arrow, they have the right to have a special "Four Winds" ceremony performed for the. Since I'm associated with the Dance Team that our O.A. Lodge hosts (my primary role in O.A. is "Dance Team Advisor"), I figured it would make sense to present our Dance Team's version of this presentation. Our Dance Team ceremony is pretty well known and regarded. We have a recorded narrative that mixes in spoken word and Native American Pow Wow songs, as well as ambient background music. We mix in multiple dance styles, representing both female and male dancers and dance styles (typically Jingle Dress, Fancy Shawl, Fancy Dance, and Grass Dance). The outfits that we have are elaborate, and they take a lot of time to put together, put on and take off. The preparation time can often take 45 to 60 minutes for a presentation that rarely last longer than fifteen or twenty minutes. Thus, my goal has been to engineer the process so that the materials can be put together quickly, taken apart quickly, and most important, put on and taken off quickly. To this end, I modified all of the clothing items I could to use side clip fasteners, and make them as adjustable as possible. I cut out the back of an old school backpack and attached it to the top cape of the dance outfit so that the neck bustle could be more easily put on and taken off. To make the fancy dance outfit even easier, I stitched the "angoras" (lower leg decorations that are made from sheep's hair) and the dance bells together into one piece, with the side clips and webbing to make them super easy to take on and off. I tested them on me, and on another analog (a younger scout) and figured it would work well for all concerned. I'm guessing some of you already know where this is going, don't you ;)? The day of the performance, we get everyone together, and I assemble everything and show them how to get into and out of the gear. Everything works flawlessly... except for one thing. The angoras for the fancy dance outfit and the wrap sleeve, side-ring clips, and webbing, even when closed down to the absolute tightest level, were still loose on the scout doing the dance. I had figured I'd covered the skinniest possible kid I could think of. Truth be told, no i hadn't, and here he was, right in front of me, wondering what to do. I told him to grab a pair of bandannas and tie them below the bells to add some extra support and pressure. When he went out to dance, even with the added support of the bandanna, one of the set of bells and angoras started sliding down his leg. At this point he looked at me with a mix of bewilderment and horror... "what do I do now?!" The only answer I could telegraph to him was "keep going". He saw that stopping to adjust was not an option, so he adapted his steps to minimize the view of the drooping bells, and after his performance was finished, he went to the area where he was to "stand as sentry" and stood still while the rest of the performers did their parts. Afterwards, many of the attendees walked up to the dancer and congratulated him on an excellent performance. Not a one of them mentioned the "mishap", though his Mom later pointed out that he looked to be struggling, but adapted effectively under the situation. 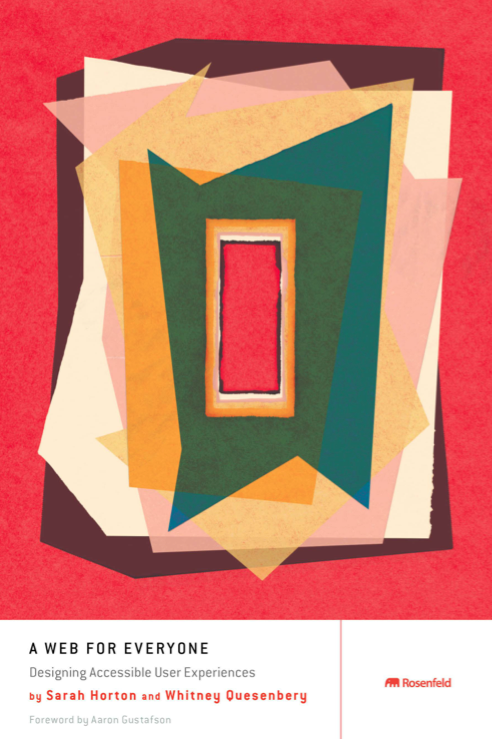 I learned that as we get closer to the end of a project or a hard deadline, we sometimes make totally innocent lapses in our thinking, and make choices that seem to be perfectly rational, but miss something important. Sometimes these events can be embarrassing, but at the same time, I told the boy in question "sure, the bells drooped, and you couldn't put on a "perfect" performance. On the other hand, of all the boys in the Troop and the Lodge that could have been out there, you were the one who actually suited up to dance. Most people will not remember that his bells drooped. They will remember that he stepped up and did something hard, something intricate, and did a pretty darned good job. We had a quick "retrospective" on the event, and we all talked about what we could do to make it work better the next time. I got some valuable feedback on the attachment designs I used, and how to modify them to make them even more effective and with a broader range for use. Most of all, though, I was reminded that, no matter how hard you try, no matter how much ground you cover, there's always something you didn't consider. Imagine yourself a person wanting to create a site today. I don’t mean going to one of those all-in-one site hosting shops and turning the crank on their template library (though there’s nothing wrong with that), I mean “start from bare teal, roll your own, make a site from scratch” kind of things. With the dizzying array of options out there, what’s an aspiring web developer to do? 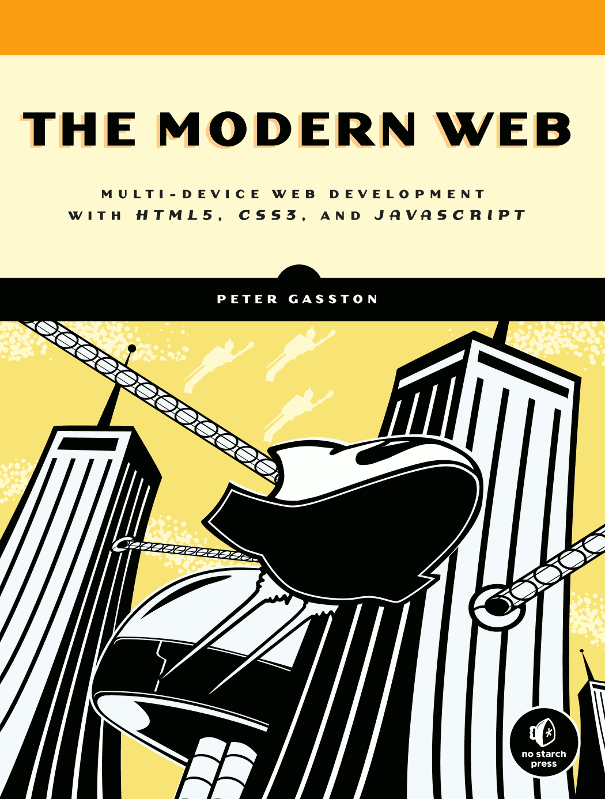 Peter Gasston (author of "The Book of CSS3”) has effectively asked the same questions, and his answer is “The Modern Web”. Peter starts with the premise that the days of making a site for just the desktop are long gone. Any site that doesn’t consider mobile as an alternate platform (and truth be told, for many people, their only platform) they’re going to miss out on a lot of people. therefore, the multi platform ideal (device agnostic) is set up front and explanations of options available take that mobile-inclusive model into account. Each chapter looks at a broad array of possible options and available tools, and provides a survey of what they can do. Each chapter ends with a Further Reading section that will take you to a variety of sites and reference points to help you wrap your head around all of these details. So what does “The Modern Web” have to say for itself? Chapter 2 is about Structure and Semantics, or to put a finer point on it, the semantic differences available now to structure documents using HTML5. One of them has become a steady companion of late, and that’s Web Accessibility Initiatives Accessible Rich Internet Applications or WAI-ARIA (usually shortened to ARIA by yours truly). If you have ever wanted to understand Accessibility and the broader 508 standard, and what you an do to get a greater appreciation of what to do to enable this, ARIA tags are a must. The ability to segment the structure of documents based on content and platform means that we spend less time trying to shoehorn our sites into specific platforms, but rather make a ubiquitous platform that can be accessed depending on the device, and create the content to reside in that framework. Chapter 3 talks about Device Responsive CSS, and at the heart of that is the ability to perform “media queries” what that means is, “tell me what device I am on, and I’ll tell you the best way to display the data.” This is a mostly theoretical chapter, showing what could happen with a variety of devices and leveraging options like Mobile first design. Chapter 4 discusses New Approaches to CSS Layouts, including how to set up multi column layouts, taking a look at the Flexbox tool, and the way it structures content, and leveraging the Grid layout so familiar to professional print publishing (defining what’s a space, where the space is, and how to allocate content to a particular space). Chapter 6 covers device API’s that are now available to web developers thanks to HTML5, etc. Options such as Geolocation, utilizing Web storage, using utilities like drag and drop, accessing the devices camera and manipulating the images captured, connecting to external sites and apps, etc. Again, this is a broad survey, not a detailed breakdown. Explore the further reading if any of these items is interesting to you. Chapter 7 looks at Images and Graphics, specifically Scalable Vector Graphics (SVG) and the canvas option in HTML5. While JPEG’s, PNG’s and GIF’s are certainly still used, these newer techniques allow for the ability to draw vector and bitmap graphics dynamically. Each has their uses, along with some sample code snippets to demonstrate them in action. Chapter 9 looks at how HTML5 handles multimedia directly using the audio and video tags, and the options to allow the user to display a variety of players, controls and options, as well as to utilize a variety of audio and video formats. Options like subtitles can be added, as well as captioned displayed at key points (think of those little pop-ups in YouTube, etc. yep, those). There are several formats, and of course, not all are compatible with all browsers, to the ability to pick and choose, or use a system’s default, adds to the robustness of the options (and also adds to the complexity of providing video and audio data native via the browser). Chapter 10 looks at the difference between a general web and mobile site, and the processes used to package a true “web app” that can be accessed and downloaded from a web marketplace like Google Store. In addition, options like Phonegap, which allows for a greater level of integration with a particular device, and AppCache, which lets a user store data on their device so they can user the app offline, get some coverage and examples. The book ends with two appendices. Appendix A covers Browser support for each of the sections in the book, while Appendix B is a gathering of chapter by chapter Further reading links and sources. The so called Modern Web is a miss mash of technologies, standards, practices and options that overlap and cover a lot of areas. There is a lot of detail crammed into this one book, and there’s a fair amount of tinkering to be done to see what works and how. Each section has a variety of examples and ways to see just what the page/site/app is doing. 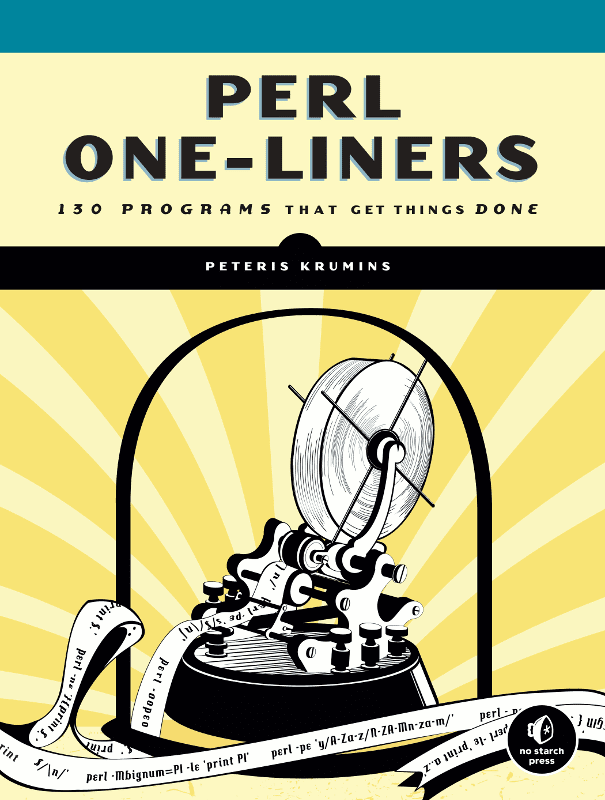 For the web developer who already has a handle on these technologies, this will be a good reference style book to examine and look for further details in the Further Reading (really, there’s a lot of “Further Reading that can be done!). The beginning Web Programmer may feel a bit lost in some of this, but with time, and practice with each option, it feels more comfortable. It’s not meant to be a HowTo book, but more of a survey course, with some specific examples spelled out here and there. I do think this book has a special niche that can benefit from it directly, and I’m lucky to be part of that group. 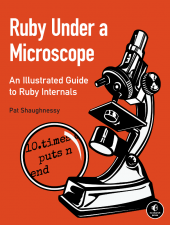 Software Testers, if you’d like a book that covers a wide array of “futuristic” web tech, the positives and negatives, and the potential pitfalls that would be of great value to a software tester, this is a wonderful addition to your library. It’s certainly been a nice addition to mine :). It's Friday, one week in to this project, and as I mentioned in an earlier comment, I reserve the right to go back and change my mind about any of the options I've worked with and what I've put together. Today, I am doing exactly that. For those who read last week's entry, I sad it would be worth your time to install the needed software on your base machine, so that you could get a feel for each of the components and what it takes to do that. While I still think there's a vale to doing that, after having to uninstall, reinstall, unconfigure, reconfigure, modify, point somewhere else, change options again, and then notice that my hardware machines just don't quite line up the way I expect them to, I have decided to heed the call of so many who left their comments on my post from last week. - if you decide to use a Linux virtual machine, your CPU, memory and disk footprint to run the VM is really small. - applications like VirtualBox and VMWare server allow for saving states and for taking snapshots. It's sort of an on-the-cheap version control, and it can save you from shooting yourself in the foot. Much more so that using your base environment to do all of this. - set up Dropbox or some other file share location, and you're golden, everything that matters gets placed in a spot where it can be accessed as you need it. I had every intention of bringing VM's into the conversation at some point, but this past week made me decide now was the best time. If you want to do these exercises in both a hardware machine and a VM, you'll learn a lot. You'll learn a lot by sticking your tongue on an icy pole in the dead of winter, too. I'll leave it as an exercise to the reader to decide if some learning is best done vicariously. In any event, if you've taken the VM route with this, smart move, you won't regret it. Next step is to set up a site with PHP. That would be great if I knew enough PHP to set up a site. Today, I can say I almost know enough to do that. PHP insertion is super easy. It's just a tag, in this case " to close, and and some basic code that would look very familiar to anyone who has ever written a sample program in C or another language anything between the tags is PHP doing the work. If you create the front end page to evaluate PHP, it will happily do so. Note, you will need to save your pages with a .php extension, instead of .html, to do this. If there's other ways to do this, be patient with me, I haven't gotten that far yet ;). 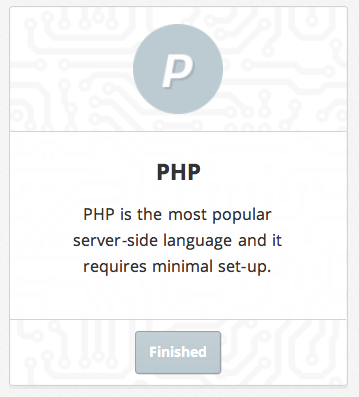 There's a lot of different resources for PHP available, and one of the quickest to play with and try out is the Codecademy course. They cover the basics of the language, as well as how to put the snippets of PHP into a web page. Another quick tutorial for building basic site elements can be seen at W3Schools, that perennial old school favorite of web arcana, and the PHP site itself likewise has a fairly quick overview of how to make pages with PHP. Right now I'm playing around with a few elements to see what I can do to create some dynamic content and reference things like images and navigation elements. Also, save these snippets in a side file with some visible explanations, either in the HTML source or on the page itself. Why? Because this can be a running note tab to remind you of things that work and why. Make a tutorial page for PHP, using mostly PHP. Get a little meta. Put the page in a place you can readily access and review. Right now, I'm doing a hit of copy/paste to add elements and examples (oh for shame! I know, I'm breaking the Zed rule #1 here). Focus on understanding what you are doing first, *then* go back and see if there are ways to save these to include files to make more efficient and refactor. Yes, I'm saying incur a little technical debt right here. That's OK, it'll make the refactoring portion of this project a little more interesting ;). My goal for this extended weekend and into next week is to get a mockup of a site, not just a page, that includes these PHP aspects, and start playing with them. Now of course, comes the tough part... how to make a site that will interest me enough to engage, but not be so detailed as to cause me to climb down too many rat holes. 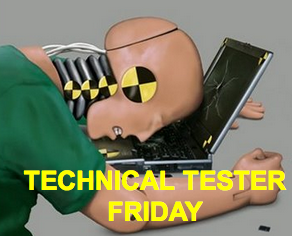 Stay tuned for next week's edition of TECHNICAL TESTER FRIDAY to see how well I did ;). The question above was prompted by a Skype Coaching session I held a couple of days ago. A new tester contacted me and asked me how they might get started with software testing, and what should they do first. Almost immediately the person who contacted me (I haven't asked their permission to share all the details, or their name, so I won't) asked me questions about automation tools, and what programming languages they should know and work on. I asked them to stop, and I shared my philosophy with them about testing, which should have as little to do with programming as possible. Don't get me wrong, programming is a perfectly wonderful skill, and I dabble in it at times, but I think we do a dis-service to those who want to be testers when we put at the primary requirement "must be a programmer with these skills and history". What I want to know is "how does a person think? What kind of avenues do they follow? Are the random, or do they hand things on a structure that others can examine, review, and comment/critique?" It was at this point that I decided to ask about something I believe every tester should know, and that's "what do you know about the scientific method?" Yes, for those who have followed me for awhile, you already know that that is one of the topics we are developing for SummerQAmp, but one of the things I wondered was "how could someone actually demonstrate they understand this?" To that end, the question popped into my head, and I figured I might as well run with it. 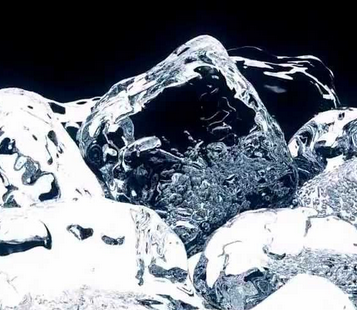 "What Force Would it take to Shatter an Ice Cube?" It's a random question, and that's what I wanted, something random and mostly removed from software testing. It's often too difficult to step in and think about making a science experiment out of software, because it feels so intangible. Physical objects, though, are perfect for these though experiments, so I figured we'd use an ice cube as a starting point for the conversation. How would someone answer that? They could make a guess. They could throw an ice cube at a wall and say "that much force"... and they'd be right.... sort of ;). We'd probably set up an experiment. right? What would we want our experiment to tell us? Could we determine the point where it happens? How would we do so? What would we need to make the experiment happen? How would we make measurements? Do we actually need measurements? What will our feedback be? What will tell how we are doing? How are we gathering data? How would we explain our results? Can we "defend" our methodology? 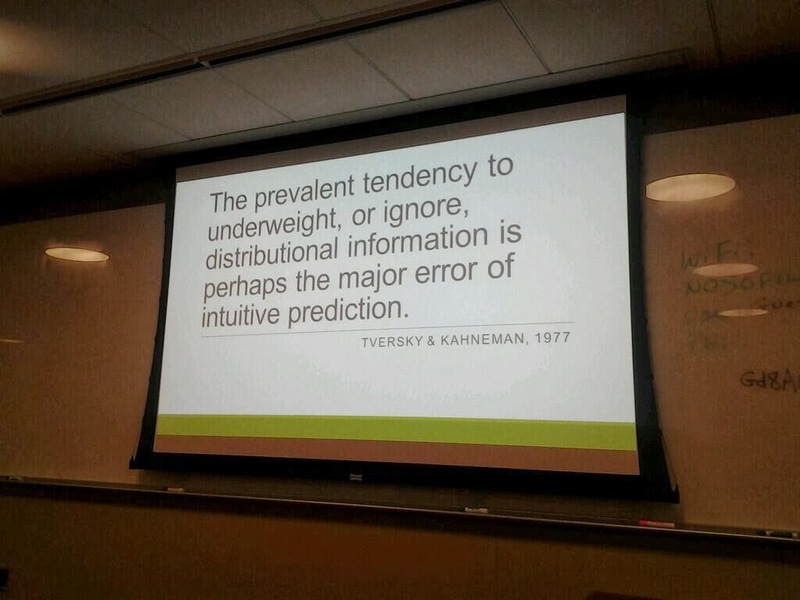 What if new information came our way; could we account for that? Would we need to repeat or redesign the experiment? I explained that the process of thinking this through, or even setting up an experiment and actually doing it, would inform them more about their own understanding and curiosity of things than any primer on testing I could give them. I remember last year discussing this for the first time with James Pulley,and how he said that the Scientific Method has to be Lesson Zero for any potential software tester. The more I consider this, the more I agree. Time will tell if the person who started this conversation follows up, but I think if they actually do this, and really think about this process in depth, as well as do some reading on the scientific Method and why it matters (and that it's not helpful for everything), then we'll be quite a ways down the road to understanding some of the foundations of what it takes to even start a conversation on what makes a good tester. Agree? Disagree? Better experiments to suggest? I'm all ears :). This past weekend, two of my kids and I decided to venture down to Harry's Hofbrau in San Jose. Why, you might ask? Well, other than the fact that it's a pretty decent restaurant with good food, it's also where the Pacific Coast Cichlid Association (PCCA) has its monthly meetings. Yes, I know some of you are scratching your heads, seeing I'm talking about "fish" again... what does this have to do with software testing? Be patient, I'm getting to that ;). The PCCA has been around for years, and I've heard about them peripherally for about as long as I've been keeping fish. However, over the years, I entered a period of complacency. I had a thriving breeding colony, and had to extend my fish out into several tanks in the house to give them some space. I was doing fine, I knew what I was doing, and I hadn't had to buy fish in years. What was a group like PCCA going to do for me? Well, as many of you know, I decided I wanted to give away the fish that had been the core of my breeding stock for several years, and that made it possible for me to add new fish for the first time in, well, close to a decade. I also elaborated on how doing that introduced a strain of ich into my tank that killed everything. From thriving to ruined in just a few weeks. I decided to rebuild, only this time, I decided it was an opportunity to do things very differently. Since none of the fish that were in my systems survived, it meant starting totally anew, and that meant I could consider a totally different biotype if I wanted to. I set my son up with a twenty gallon tank exclusively with Lake Malawi cichlids, as well as a Royal Pleco because it looks cool. I built a 20 gallon quarantine tank in my half bathroom upstairs (seemed a logical place to put it ;) ), and set up once again my show tank (65 gallons) in the hope that I could reinvigorate the population. As I was doing this, I realized, hey, the PCCA is having its monthly meeting at Harry's Hofbrau on Saturday... maybe me and the kids should head down and check it out?" One meeting later, that was surprisingly like a traditional Meetup, only with a fish auction at the end (of which we took home three new fish) we were card carrying members of the PCCA, and are already talking with and communicating with other members on next steps. I promised this had something to do with testing, so I thank you for your patience. Very often, test practitioners go through their careers without even realizing that there's a community of other testers out there. They fall into the role, they read a little bit, they do some work and it meets a need. Thus, they feel like they have things covered. They don't really need to be disturbed, or so they think. Typically, this state of affairs lasts until something catastrophic happens, or barring catastrophe, something that really brings into question your supposed expertise and skill. Some react defensively, some reflect, and some decide that maybe they need some help. It's at this point where community becomes critical, and encouraging others to get engaged, to participate in the "thrill of the chase" to find what they need, comes into play. 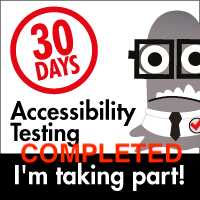 We often want to encourage other testers to join us. Heck, we scream for it! The problem is, our screaming won't register with those who have no desire to hunt. It won't matter to those who don't have a sense of the thrill of the chase, and the fact is, those of us who heed that call do so because we've decided we need something more. We tend to equate the idea that the really good testers are the ones that are engaged in the broader community, but is that because we are good at what we do, or is it because we are the type that will engage, that that helps us become better than we would if we didn't engage with the broader community? This past weekend reminded me that most of us fall on a continuum of expertise and understanding. Many of us feel that we know enough to go it alone. Many of us find value in community engagement. We look to see if we can engage others and come with us, but as my fish keeping history has reminded me, we seek when we are ready to seek, and we get help or reach out to community when we reach a point where that is what we want to do. Perhaps the better approach is not to put out what we are and what we can do, but to let them discover us, and if they are inclined enough to chase after us, then let them :). My challenge to myself, with the full blessing of Noah Sussman, was to take the ideas from his proposed book, specifically his table of contents and their suggestions, and put them into practice. As I have been looking over this process, I’ve realized that this is not a project that really makes sense to post as a single "chapter" kind of thing. For starters, some of the steps take days, or even weeks, to put into place. Some of the sections are dealing with areas I have no exposure to currently, or I have scattered exposure. Mostly, this is going to require a continued connection, and daily practice, to make happen. It’s with that in mind that I have decided to approach this as my own case study. My goal is to post something every Friday, regardless of how much or how little content there may be. 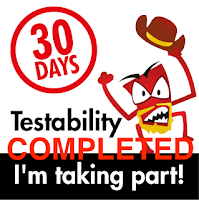 Some Fridays may have more than one post, and may cover other topics, but I am committing to a weekly post, in some form, that starts with “TECHNICAL TESTER FRIDAY: [Fill in the Blank]”. This is the first draft of the table of contents of a book that I have been writing. It’s worth noting that this entire program can be worked through without spending a penny on proprietary software (with the optional exception of Charles). It also does not require a powerful computer — you could do all this on a five year old MacBook. Where possible, I'm going to emphasize materials and sources that are freely available. I may reference a book here and there if it seems like it would be helpful (and there are some books listed in this journey, so expect that I will be reviewing the ones mentioned). 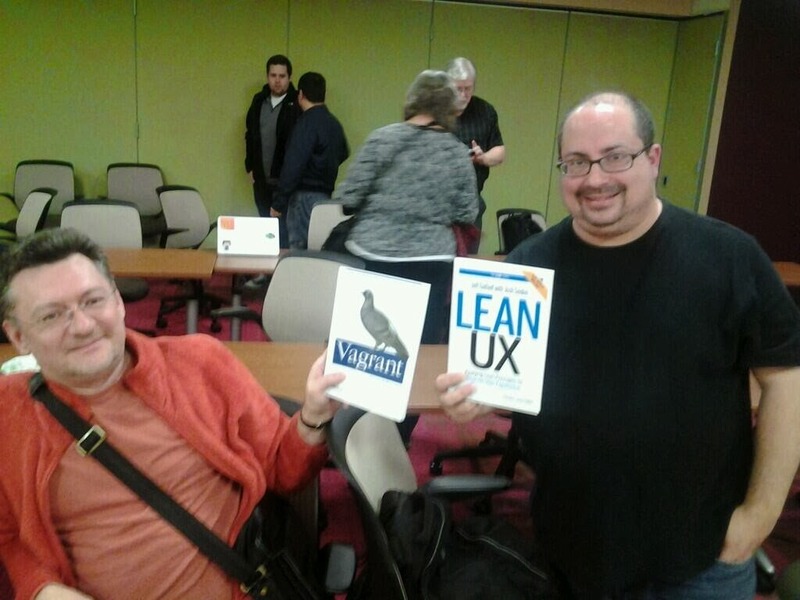 For grins, I'm doing this in two environments (and potentially more). The first is a MacBookPro, and the second is a Toshiba Satellite PC laptop. Why both? Because I think it makes sense to see how things will work in two significantly different environments, and what adaptations I might need to make. Also, while the MacBook has almost all of the software in place by default, the PC users will have to install everything individually. Thus, today's entry is a quick cheat sheet on getting set up for this "first chapter". Use PHP to put up your own Web site. Spend a couple of weeks making it a reasonably decent looking site. It doesn’t matter what the site is or whether it has any transactional functionality. Just some pages that display photos and content is fine. All right, let's get the first caveat out of the way... I have never set up a site to use PHP. Ever. GASP!!! Somehow, I've either managed to work with three-tier systems (old school stuff that used CGI::Perl), DotNetNuke frameworks that were all based around .NET, Rails sites, or some other established web framework. 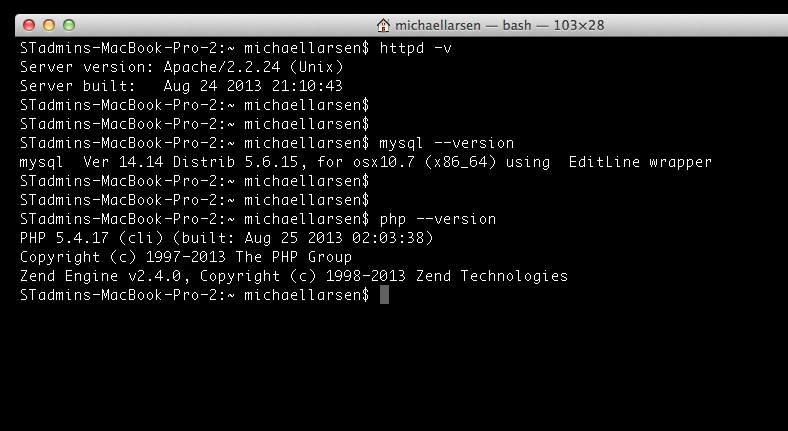 For some reason, PHP just never entered into the mix of my regular everyday interactions. It seems this project is going to change that. This is pretty straightforward. Download the latest MSI build for the fastest setup. Give it some basic parameters so that it can be recognized on the network. Regardless of your configuration, if you take the default options, the server will be accessible at http://localhost:80/. If you see "It works, well, it works ;). Note that this will take you to Oracle and their Cloud Delivery section. You will need a user name and a password. Download the MSI for the quickest installation (of course, if you want to download the nightly builds to be more wild and crazy, that's a great exercise in and of itself ;) ). 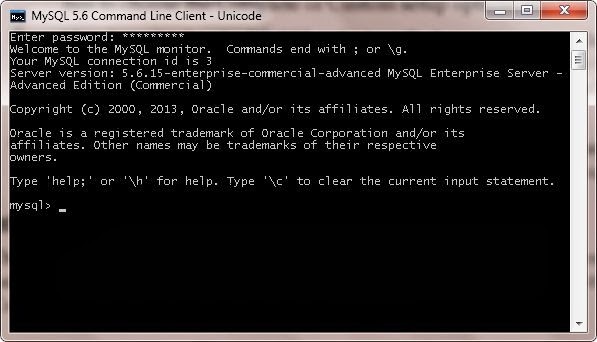 For my purposes, I am just installing the generic MySQL server. Once it's installed, you can open the command line option from the Start Menu (Start: All Programs: MySQL: MySQL 5.6 Server: MySQL 5.6 Server Command Line Client). This is the one part of this puzzle that doesn't come pre-installed on your Mac (versions of httpd and php are already installed and ready to use). You will need to have Administrator access to complete the installation. Default options will be fine. For Windows, this is fairly simple. Just download the files, unzip them, put them in a folder (C:\PHP is as good a place as any), and then add C:\PHP to your %PATH%. With this in place, you can write scripts in PHP and the system will respond. So there we have it. Now that I have an environment I can poke at locally, I can start playing with things under total local control. Additionally, I also have access to an external "commercial" site that will allow me to do many of the same things. More about that in future posts. Yeah, I know, not very exciting, but it's a start, and that's what I've needed to do for awhile now, just get this started. Now I'm honor bound to give you all something more meaty by next week :).